Clothing labels are very small details that we can find in many products like, personalised t-shirts. It may seem a not relevant aspect, but this is a very important and relevant detail. Discover more today! A good personalised t-shirt like any other textile printing is a combination of several factors and details that together make the product. Among these factors we find personalised labels, product quality, printing and more. All these factors that make up a customised product have its importance and relevance to make the final product, a high quality product. If one of these factors fails, the final product could be a low quality product or it could not perform the function it’s meant to do. Clothing labels are part of these fundamental factors that make up a personalised T-shirt. Many people think they are insignificant details and that they are not important for a personalised T-shirt. But all the shirts must have a label where they show the washing information and the city where the garment was made. If this is not taken into account we may have legal problems later, which I assure you will not want. Clothing labels can give your textile prints a different image. That’s why we’ll show you what kind of personalised labels will help show what type of image. This is one of the most popular techniques for clothing printing and labelling. It is usually white and is polyester based which means it is printed in a maximum of four colors. This is a good option for small texts, it leaves a soft finished which reduces irritation in the neck. This type of labels are very useful show the washing information of the garment. But it also serves for labels dona appears the name of the brand and size. This is a small space but they give great value to the garment because by putting your brand or a keyword you can have more contact with your customers. But it also works for labels where appear the name of the brand and the size. With our technology we can print the label directly to the neck of the shirt. This is an excellent option for white garments that do not contain much text. For digital printing there is also a minimum amount required. Many people are attracted to this type of labeling because they like the finishes that it provides. This gives the garment a very fine and high quality finish. It also helps the brand empower its garments. Woven satin labels give a much more professional and sophisticated image. These labels use a maximum of 4 colors but we recommend you not to use more than two. This type of labels are very useful to include them in the seams on the sides or bottom of the shirts. This gives a lot of power to the garment. It is a very small space, but it empowers the garment with the brand to which it belongs. If you have any requirement of the brand such as color guidelines then screen printing is the method you are looking for. This is that thanks to our Pantone machine we make sure that all the colors in your brand combine perfectly. It gives an impression similar to digital printing and also provides excellent quality and definition. It also gives the same benefits as DTG. 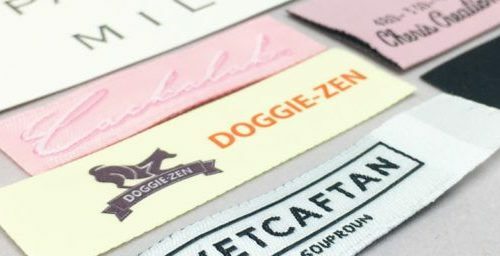 So although it seems such a small and irrelevant detail for a personalised shirt or for any other garment, we see that personalised labels have a great role in everything that involves textile printing. All those who are thinking of making a textile print should take into account the personalised labels they will use. Garment Printing can help you with your textile printing and your personalised labels. Thanks to our experience we are trained to help and advise you in both processes and make your final product as it is expected.